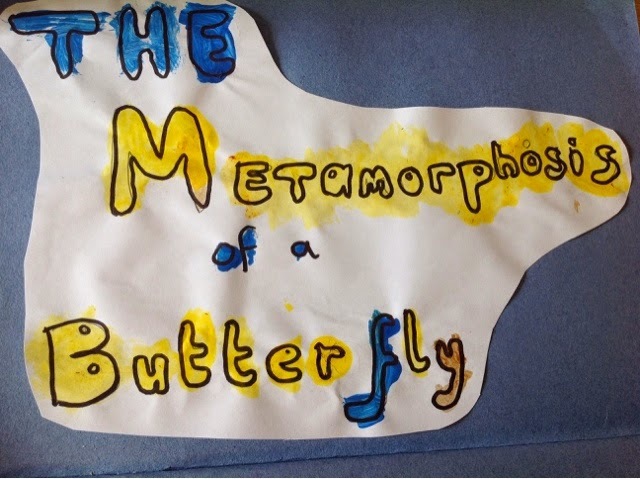 The girls have all been learning about Metamorphosis and have started a project on Ecology, which obviously all links in. They are fascinated, who wouldn't be? Nature is such a fascinating subject. A butterfly's life starts out as an egg. For this bit you need a piece of paper, some green paint and a paper plate - oh and a small hand. We put some green paint on the paper plate and got her small hand, just the palm and fingers, covered in paint. We did a hand print with fingers squished tight using green paint - I told her this was the leaf, like in the story. We then cut out a small egg shape from white card (paper would do) and glued it to the hand-printed leaf. I told my youngest, this is the egg. FACT: Most caterpillar eggs take 4 - 10 days to hatch. 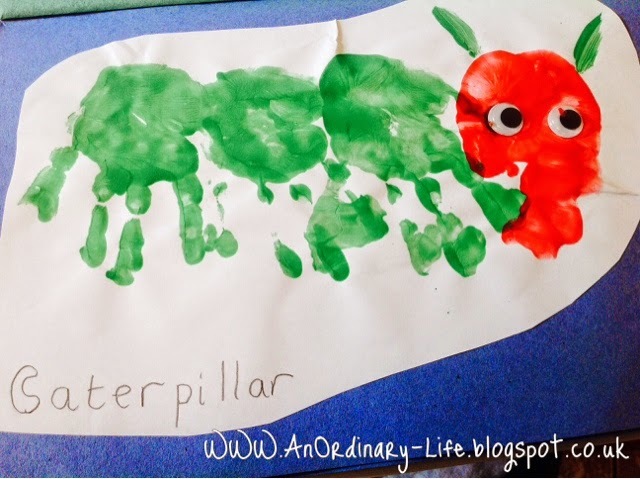 To make the caterpillar you will need a piece of paper, green paint, red paint, a second paper plate and two googly eyes! 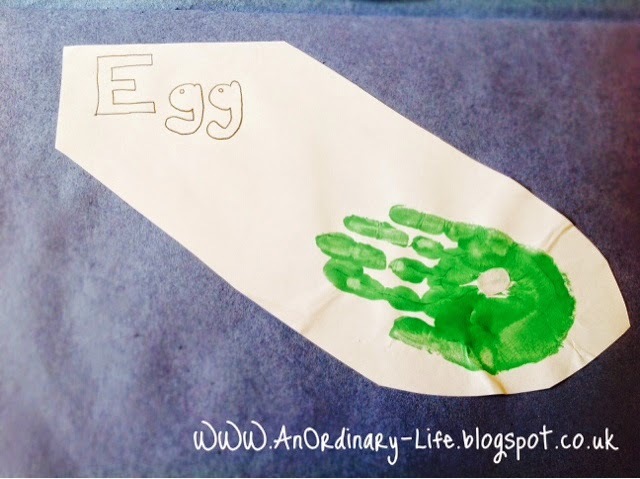 We made three hand prints, fingers spread, in green for the legs. We the did a hand print in red, with fingers squished together, for the head. Leave it to dry and then stick on the eyes. Caterpillars increase their body mass by 1000 times or more! Caterpillars have as many as 4000 muscles in it's body! Caterpillars, like butterflies, have only 6 legs - they also have 5 sets of prolegs on it's abdominal segments but these are not 'real' legs like the set on their thoracic segment. Caterpillars can produce silk using modified salivary glands that are along the sides of their mouth. 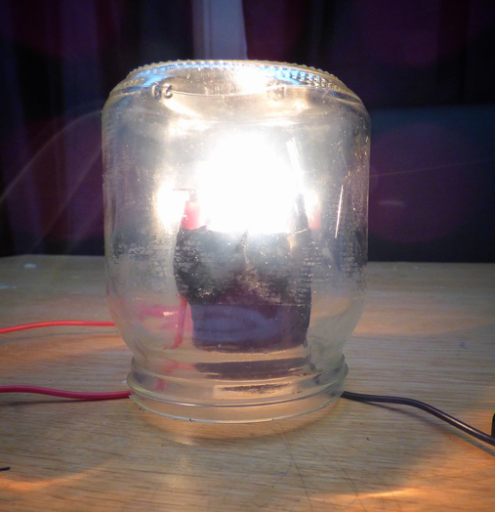 To make the pupa I just drew a very simple shape similar to a chrysalis, or pupa by it's other name. 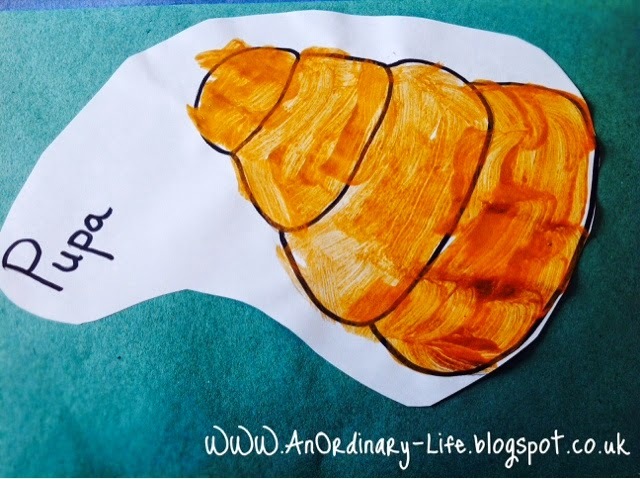 I let her colour it in a golden colour with a paint brush and talked about what happens inside the pupa. When the caterpillar sheds it's last skin it reveals it's chrysalis, it's pupa. Inside the chrysalis the caterpillar liquifies, it then re organises itself to become the cells, tissues and organs of a butterfly! 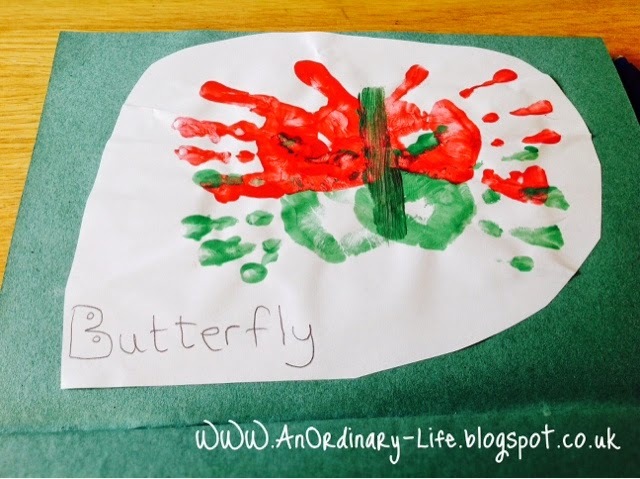 Lastly, to make the butterfly we used the same two paper plates - one for the green paint and one for the red - a new piece of paper, some wet wipes for cleaning hands and a paint brush. First we put both the left and right little hand in one colour of the two paints on the paper plates, we chose green first. 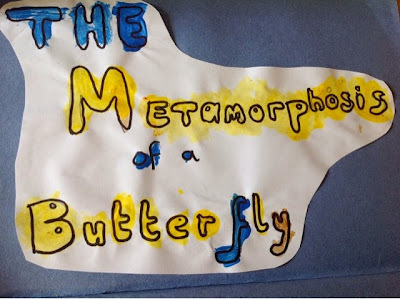 We pressed down on the paper with fingers spread - We did one hand at a time to make the bottom part of the wings. We then washed our little hands and then came back and made the second part of the wings with the red paint in the same way as we did with the green paint but pressing just above the green hand prints. TIP: it's best if the second lot of hand prints slightly over lap the first. Also print in a way that the thumbs are facing upwards. We finished it off by adding a body, a line down the centre, and the antenna too with a paint brush. Any colour paint would do. Butterflies have no ears! They feel vibrations through their wings instead to detect noise. Butterflies taste with their feet - yes, it's true, they have taste buds on their feet! A female butterfly lands on different plants, drumming the leaves with her feet to make the plant release its juices. She has spines on the back of her legs that chemoreceptors, these chemoreceptors detect the right match of plant chemicals to lay her eggs, she will only lay her eggs on a plant suitable for her young. Butterflies live on an all liquid diet. Butterflies drink from muddy puddles to get the minerals they need to be healthy, although most of what they drink and eat is sugary foods like nectar. Butterflies live on average for 2-4 weeks.